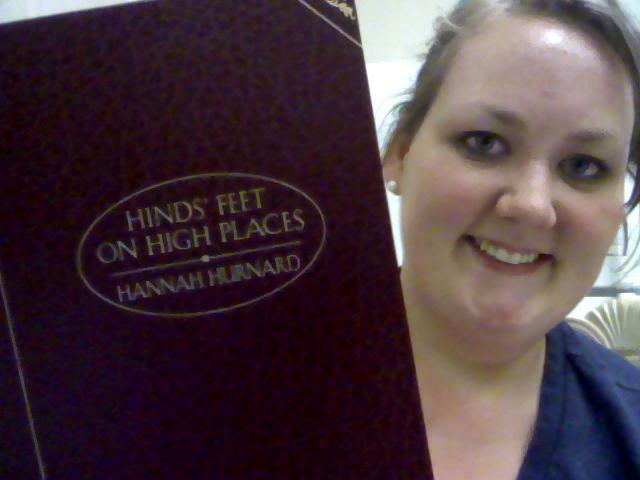 Yesterday I finished reading "Hinds Feet on High Places" by Hannah Hurnard. 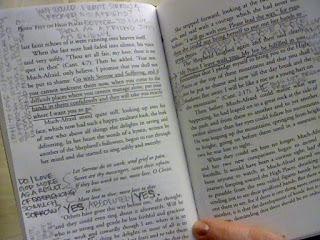 The book was sent to me by a friend in October of 2010. 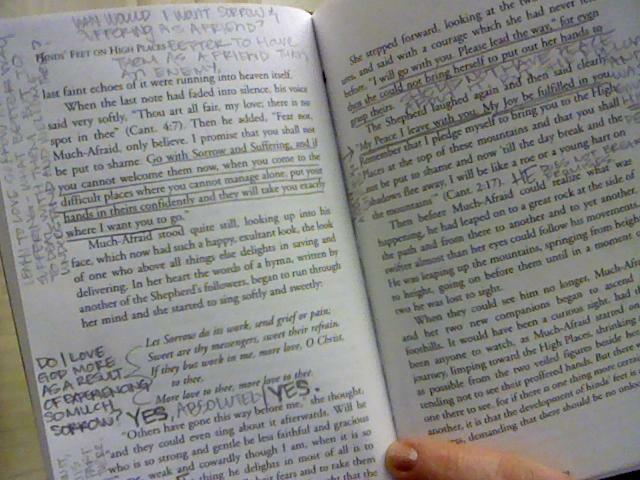 Now, I pride myself on being a quick reader... I mean I generally read 300+ page books in one sitting, but this one was different. This book was special because I 100% believe that God placed this book in my life, and enticed me to read it only when He thought I was ready to learn. I've written a few other posts about this book before and as I think back to the times I picked up the book I am overwhelmed by God's sovereignty through something I love to do like reading! - God plants the seed of salvation - though he may use others to do it. - God chooses specific people to support and guide us on our journey out of the Valley. - We have the power to resist temptation and not fall victim to our disfigurements through Christ, but we have to choose to use that power. - God suffers through our sorrows with us. God is not exempt from being vulnerable to pain as a result of love even though He created both. He feels our sorrows, but He also feels pain when we cause Him to by disobedience... because He loves us so much. Today I sat down and wrote a few major lessons I have learned from this book. I asked God after Daddy died to teach me through it, to not let me waste the heartache and not learn from it... so I'm going to add these to the list of lessons learned, and therefore answered prayers since his death. 1) Sorrow and Suffering do not have to be your enemies - if you let them, they can be the most comforting friends you can ever know... they can eventually become Joy and Peace. I have learned more about my God, about myself, about my faith with them as my companions than any other time in my life. Joy is easier to obtain than Peace, but I don't believe you can truly have Joy in a situation without Peace. 2) The Valleys in life are for a purpose... even (I believe) one of Daddy's biggest tasks/goals in life was for his children to know and love the Lord - How much satisfaction must he have knowing that my darkest valley in life has brought me closer to God.... I mean I am physically farther away from my earthly father as I can ever be, but closer to my Heavenly Father than I have ever been. 3) I have been challenged to live in the place He puts me (physically, mentally, emotionally, and spiritually)... to really be there and to learn all I can and serve all I can because I will be there "until he makes me what he has determined I ought to be. (HFonHP, Chapter 13)" He has me here for a reason and I may never understand why, but I will not move on until I have learned what I need to, or served who I need to. I have to come to peace with the unknown factor of my future ... which is always on my heart. For if I am constantly living for the future (thoughts of future jobs, husband, children, etc...) then I can't learn what I need to learn now. 4) If I'm in a valley... learn from it. And as hard as it is, rejoice in the lessons learned there. In fact, lessons learned in the valleys are the hardest to learn, therefore they should be celebrated even more. 5) There will always be unanswered questions... but peace with the unanswered questions is the ultimate goal. 6) Don't be your worst critic like "Much Afraid" (the main character) was. She was not confident in who she was, and members of her own family were sent to highlight all of her insecurities. Those insecurities, much to their dismay were the things that the Shepherd used to turn her into her new self (trying not to give anything away!). We should not be out own worst critic, because Satan already has that job. The more confident we are in the person He has created us to be... the easier we are able to ignore Satan's criticisms that come in all different forms. If you are in one of those Valleys, and can handle a really long allegory... I definitely suggest this book. But... even if you can't handle it, if you ask Him I am confident that He will use something in your life to teach you the lessons you need to learn... and I'm truly thankful for these He has taught me. If you drive I-20/59 thru Tuscaloosa it is very obvious where April's tornado traveled. You can see trees blown sideways and the path the storm took. It was these trees, and this path which got me to thinking... you see there were bare trees next to fruitful ones. There were tall pines with needles next to skinny trunks without a stitch of green to be seen. Some of both, the bare and the fruitful, were interspersed right next to each other. It caused me to wonder how one could have been hit by the storm and not the other, and also (this thought just occuring to me now as I write this) that maybe both were hit but only one recovered... only one's roots were strong enough to bear fruit again. I think we, God's children, are just like these trees. We can only see each other on the outside, we can only see the physical scars of life's storms... we can't see the roots that have created us to be who we are. Those roots may be strong, they may be weak... they may be rooted just enough to help us hold on during the torments of life, but praise God we have those roots and they are what we make of them. Now I know that the rough childhood he spoke of was weather, but once again... we are like these trees. That little one who was twisted and marred by a storm still grew strong and tall, it just carried the "memories" of the bad times with it. But ultimately, it grew... isn't that what matters? We must, as indivuduals, determine how we are going to make it through the rough seasons in life... whether our roots are supporting us or are holding us back in a place (or a person) we don't want to be. As I looked at those trees in Tuscaloosa I wondered how God picked the path of that F5 tornado that took so many lives... How did one tree survive to bloom this season and another not. Though that other tree may bloom in a year or so... right now it looks dead, it looks sad. How much are we like those trees sometime in life. One friend may be having a fine season of growth, while another is dealing with a death in the family or loss of a job. 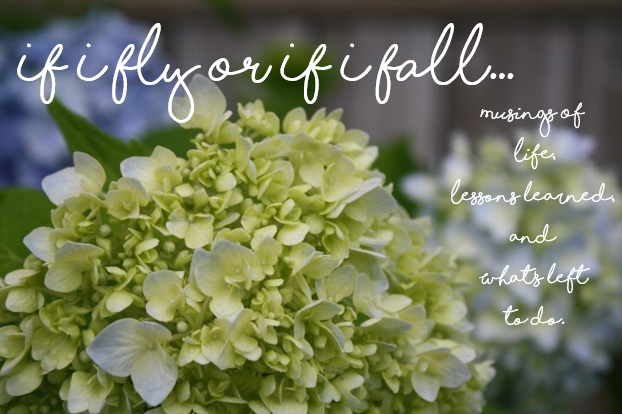 We must always remember, however, that though this season we may be blooming, the next tornado or hurricane of a cancer scare or quarter life crisis may hit us and hit us hard. What shall we do in those situations? We must make the decision to grow. We must make the decision to use these storms to dig our supporting roots deeper in our faith and our experiences and not to let them hold us back and stifle our growth because if they do, we cannot progress and process through that season. Lucky for us, the seasons in our lives don't stick to an Equinox/Solstice calendar. They may last a day, a month, a few years... but once again, we are put in those seasons by our Lord, for a reason. I think the goal for me during any season is not to find out why I am there, but simply to learn from it, to add it to my roots... because no matter what season in life it may be, I choose for those scars, those storms, those blooms to help me grow in my own time. I am in a season right now, and have been for quite a while, in which I am seeking to determine God's will for me professionally. Frankly, I've been in this season longer than I would like...but it's the season He has me in and it is where I will be till I have learned what He wants me to. I accept that and I seek to learn. I pray that 2012 is a good one for us all. I pray that the Lord sees fit for me to move on to another season in life and that I will have learned from the one I am in now. I pray that storms won't hit me or those I hold dear this year, but if and when they do I pray we will learn, and process, and progress thru them.